The Monarch is SpinOlution's production studio wheel for professional spinners who need a comfortable wheel that they can spin at for hours. Featuring toe breaks for stopping on a dime, and 5 different flyer head sizes to choose from (4A oz, 8 oz, 16 oz, 32 oz, and 64 oz) - there is no other wheel as versatile on the market as the Monarch. MODULAR WHEEL. SpinOlution's 8 oz, 16 oz, 32 oz, and 64 oz flyers are interchangeable between the Monarch and the Firefly. Swap flyers between these two wheel bases for multiple wheel options. Please note: The product can differ slightly from shown photos, since SpinOlution improves their products continuously. 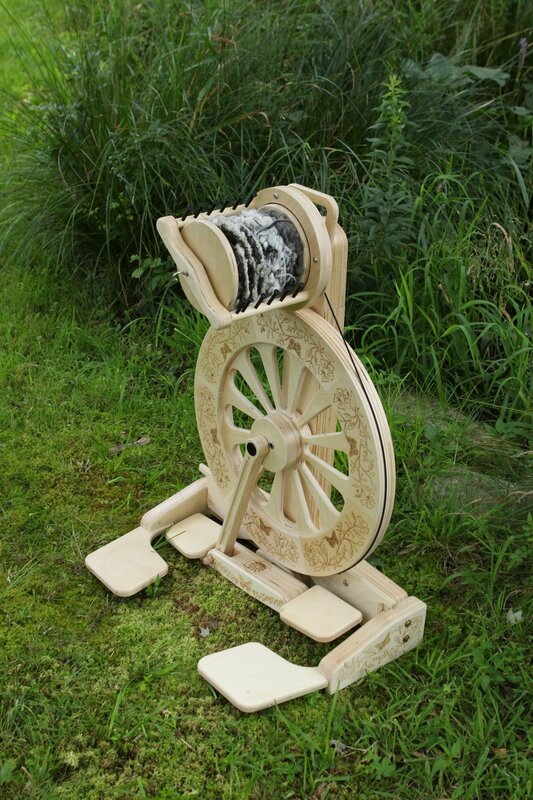 Wheel comes with specified Flyer Head and bobbin quantity. Engraving (as in photo) available on special order with separate fee.